Set the over-edge thread length – at the twist of a knob. A serger with a chainstitch, four cover stitches and four combination stitches (chainstitch/overlock stitch). The hard-wearing safety seam (combination stitch) is ideal for reliably joining firm woven fabrics, such as jeans. The 3- and 4-thread coverstitch gives you an especially durable, flat stitch in highly elastic fabrics. The BERNINA lay-in system lets you thread quickly and directly – and it’s also simple to thread the lower looper, thanks to the automatic lower-looper threading system. Easy, ergonomic operation: With the aid of the vision panel and the red position indicators, you’ll find the ideal position of the needles and lower looper for threading straightaway. Thanks to the patented mtc thread control, it‘s finally possible to directly set the over-edge thread length and achieve the perfect seam at the twist of a knob! Front Foot Lift System The front foot lift gives an additional lift to the front of the presser foot, making it possible to accurately position multiple layers of fabric and bulky projects such as hand-knitted jumpers underneath it. 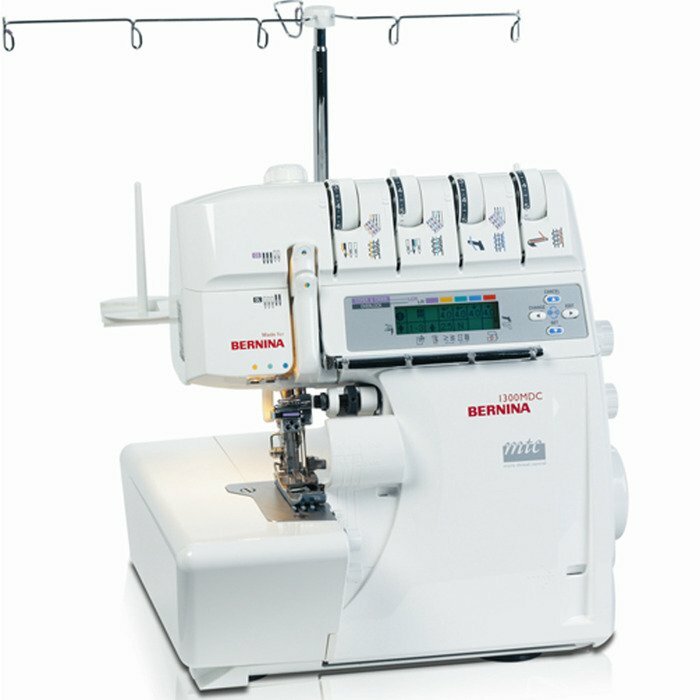 The BERNINA lay-in system lets you thread quickly and directly at all times. Thanks to the automatic lower-looper threading system, it’s also a cinch to thread the lower loopers. Provides the greatest, most robust cutting force. Even thick fabrics won’t deflect the upper knife – so all fabric edges can be trimmed safely and professionally. The upper knife arm can be quick-released effortlessly at the press of a button to provide more room. This is particularly advantageous when, for example, you’re working in coverstitch mode, or do not wish to trim the fabric edge. Here you’ll find the most commonly used accessories, neatly arranged and ready-to-hand. Easy, ergonomic operation: With the aid of the vision panel and the red position indicators, you’ll find the ideal threading position for the needles and the lower looper straightaway. Simply flick the rolled hem lever to switch effortlessly to a rolled hem stitch and back again, with no need to change the stitch plate or presser foot.